Here at Who What Wear, we're quite fascinated by the Zara shopping habits of girls all over the world. It truly is the definition of a global company, with its home base in Spain and stores and e-comm delivery all over the world. Which brings us to the sartorially intriguing subject of British girls. In the U.S., there are specific Zara categories and items that just take off season after season and that we see women wearing on repeat. But what about in the UK? What are they shopping for and wearing in Great Britain right now? What's selling out? Our curiosity led us straight to a cool British fashion girl herself, Emma Spedding, the deputy editor of Who What Wear UK. 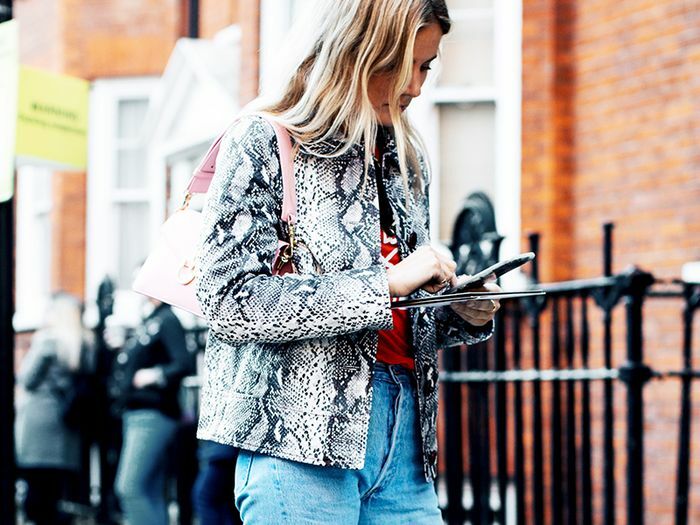 Spedding is a Zara shopper herself and being a fashion editor, her Zara radar is naturally top-notch. She filled us in on all the pieces British girls are clamoring for at Zara right now and we found her insider information to be quite intriguing, especially when we compared it to what American girls are always shopping for. Spedding divulged, "Like Americans, us Brits turn to Zara for trend-led pieces like satin shoes and pearl-embellished jeans, but I think us Brits tend to lean on Zara for the tailoring, outerwear and knitwear the most. You really do spot the famous blue and white coat (it has its own Instagram account called @thatcoat) everywhere across the country, and I'd guess most Brits own at least one simple Zara jumper." Read on to see for yourself which Zara pieces British girls actually buy from Zara compared to what American girls are buying. Zara currently has a slew of updated denim jackets, including ruffled, embroidered, and colored iterations—and they're a hit in the U.S.
Gingham tops are everywhere right now, especially Zara's statement sleeve versions, which keep selling out. Basket bags are undoubtedly the It style this season, and we keep seeing this pom-pom–trimmed crossbody, for good reason. Zara's gorgeous printed kimonos worn over a tee and jeans has been a go-to look for American girls as of late. If this dress looks familiar, it's because tons of girls on this side of the pond have been wearing it this summer. American girls love Zara's ultra-affordable tees, especially when they feature special details like the frilled trip on this cropped iteration. While wrap tops (especially the above striped iteration) are undoubtedly an It item in the UK right now, at least in Who What Wear's Los Angeles headquarters, these satin slides are the Zara It item of summer 2017. Next, find out how to tell how soon a Zara piece will sell out.